The face is leathery and looks lived-in. It has often been likened to that of Wallace Beery — a similarity suggested by the jowls and spaced teeth. The voice is a deep growl constantly going lower and lower until it explodes in thunderous laughter. The talk has rural Kentucky laced into it: the inflection is unpredictable, the sentences do not stop nor start, and the grammar is without much instruction. These attributes belong to one of the most charming personalities you've ever met. He is, without doubt, one of the most huggable guys to ever roar around in race cars, rasslin’ trunks or speedboats. He is, of course, Mr. William E. Cantrell, Wild Bill Cantrell. Thirty years ago this week, Bill Cantrell won the Gold Cup here on the Detroit River. In fact, during the summer of 1949 Cantrell won nearly every other race on the circuit, too, all of them in My Sweetie. And Detroit became the headquarters for the new national champion's professional services: Cantrell stayed here for the next twenty-six years — variously driving, designing, and building speedboats operated by Horace Dodge, Jack Schafer and Joe and Lee Schoenith. Today, Cantrell is retired — if it can be called that — to a little machine shop, up the hill from the Ohio River in Madison, Indiana. There, with long-time friend Graham Heath, Cantrell is president of the C & H Machine Company. Unlike other shops of its kind, there are about a dozen Allison V-1710 engines sitting in the back, and there's an old hydroplane parked in front. Cantrell goes to work at this place around nine, every day of the week. Cantrell is one of those wonderful exceptions to whatever imagery is associated with age — the stereotypic dottering, forgetful, crotchety old men who hate little kids. Cantrell is none of these. Like the good racer he was, he still doesn't slow down very much for the turns. His active racing days over, Cantrell has found new avenues of involvement. At 71, he finds himself the chief curator of a large oral history of American powerboating. And he seems to look forward to the frequent visits of cronies, neighborhood kids and even strangers who stop by his shop for a dosage of yarns. Cantrell possibly enjoys recounting the past as much as he loved its presence. In addition to storyteller, Cantrell is also a critic of sorts. Cantrell's recollections are spiked with both Ohio River cracker-barrel and reasoned analysis. Between the thigh-thumping tales of times and persons past, are some utterly serious pronouncements about powerboating's current state-of-affairs. Both the oracles and the oratory are to be expected from someone who cares so much about boatracing. Forgoing marriage and children, Cantrell directed his passions toward speedboats and his paternal efforts to making them go faster. A few months ago, I went to visit Cantrell, to learn more about earlier times. For a simple starter, I asked the obligatory first question: "That's a funny name you've got — Wild Bill. It is on your birth certificate, or what?" Most everyone knows the story, but it's always amusing to hear Cantrell tell it again. "That's ancient history, way back in 1927. Well, one Sunday we were racing down at Shaunee Park, just below Louisville, Kentucky. They were putting on an outboard race, and all the people from the boat clubs around there had their family runabouts. It was just a get-together, kind of a picnic and a promotional deal for a big real estate developer. Well, some driver didn't show up so this guy who owned the Falls City Boatworks — Charles "Soupy" Ciconett — said, 'Well, go on there, Bill and take a ride in that boat. He can run it.' So I got in there and fired it up. Now the engines were either 2½ or eight horsepower Johnsons. And of course then you mixed your oil with the gas and poured it into the tank. That was your lubrication, too. And my hands were awfully greasy. And you steered these boats with a long tiller, they weren't easy to steer. To get up on a plane, you put a long stick on the tiller handle so when you got the nose up, you could bet back in the boat and steer it from the side. The only throttle you had was either closed or open. So anyway, I was trying to turn it. And I had a long rubber casing on the stick. And it was slick. And the steering was real loose on it. And I started wobbling down the River, and I ran over a couple of canoes and anchor lines, and ended up on the riverbank. And Soupy Ciconett said, 'Look at that Wild Bill go!' And that's the way I got named 'Wild Bill'. The name stuck, and I've carried it ever since. Even while I was rasslin’." In the late twenties, Cantrell continued to race outboards. But he earned a living installing radio antennas in Louisville. In 1928 — the year Bill Muncey was born — Cantrell was 20 and in search of an ambition common to men his age: he wanted to be a fighter, a boxer. At a local YMCA, the rigors associated with boxing instruction soon discouraged the aspiring pugilist. As an alternative, he turned to wrestling. For several years, Cantrell wrestled as an amateur against college kids in Kentucky and Indiana. Amateur wrestling became an unneeded and irrelevant pastime in the late twenties. The day-to-day reality of hard times was even more cruel to the country folk in the rural sectors than to the unemployable laborers and ruined stockholders of the cities. Cantrell's solution was to enter the world of grunt-and-groan: he became "Wild Bill" the professional rassler. In remembering those years, Cantrell's smile cracks a little wider, and he winks conspiratorially: "It was a tumbling act, just like it is today, except back then you had to be able to rassle because sometimes you had to have what they called a 'shootin’ match' — that's when you go in and do your best with a guy to see who's gonna stay in that territory." For several years, Cantrell roamed the midwestern countryside on the carnival circuit. "I ran the midget race cars on dirt tracks in the daytime and I rassel'd winner-take-all on the 'ad show' at night. The 'ad show' would be held in a tent with a stage outside. And you'd go up there on the stage, and challenge someone to rassle you. They would bark you up and ballyhoo you and to get up the heat, you'd pick out some big bruiser in the audience — the bully of the town, ya know. And you'd find out who he was, and spit in his face! An man, they came at you, and you had your match right then. And I tell ya, some of these country boys get a hold on you, why they'd saw your head off. But you had the referee working with you, and when he saw you were in trouble, he'd break it up. But for every minute they's stay with you, they'd get five dollars. Well in those days, you couldn't let a guy stay in there long. You had to beat him quick, or it cost you a lot of money." Cantrell plied this unholy trade for nine years in the small towns of Arkansas, Mississippi, Tennessee, Kentucky, and Indiana. "Now believe me, it wasn't to defraud the public or anything else. It was just a way of life, and it's going on the same way now. But I enjoyed it, it was a challenge — just like boat racing." Ironically, Cantrell's wrestling brought him closer to the network of Gold Cup racers based in Detroit. "I rassled for Adam Weissmuller the promoter in Pontiac, Flint, Jackson and several small towns in that territory. And I was rasslin’ at the Arena Gardens down on Woodward Avenue. A newspaper guy was there — Harry LeDuc — and we got to talkin’ about Gar Wood. And I said, 'Sure would like to see that boat.' I was interested in anything connected with boats — I wasn't interested in anything else. And we started talking about boats, and I told LeDuc about our racing in the Mississippi Valley. I wrote home and got a bunch of pictures and brought them back and showed them to him pictures of the Who Cares, the Why Worry, the Louisville Kid, the Eucestro, the Kentucky Colonel, the Hoosier Boy, the Hoosier Girl and the Hermes — all those boats. LeDuc was quite interested in them." After the Depression, Cantrell returned to Detroit, on several occasions with his own boats to race in the 725 limited class. Cantrell has now established a reputation in the 725 class in the Ohio Valley, and LeDuc remembers him from those sweaty nights at the Arena Gardens. "When I came back with the Why Worry boats, Harry LeDuc — I'd say one of the best reporters in the business — he interviewed me. And I was on top then. Oh, I had all the records in the 725s, and I had won both the Brad Price Trophy and the Webb Trophy three times." Still, Cantrell's prominence in the Gold Cup class was yet to come. In the late forties, Cantrell tried his hand in car racing at Indianapolis, and he achieved modest success. "I tried it five times, but I only qualified twice — in '48 and '49. I fooled around with a couple of teams, trying to get them going. Then all the good rides were gone, and that was the end of that." After the disappointments at Indianapolis, Cantrell's telephone rang. 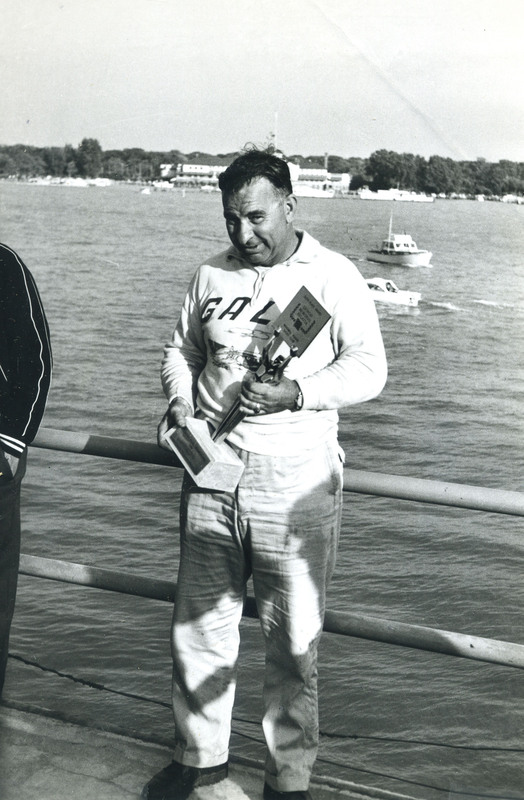 At the other end were two, young Detroit boatracers — Ed Gregory and Ed Schoenherr. "They called and asked me if I'd take a ride in the My Sweetie. And I said, 'well, who built it?' And they told me. And I knew of John Hacker, he had quite a reputation. And I said, 'Yeah, I'll come up and take a ride in it.' They told me what power they had in it." "They were two young guys. Their daddy had a boat in the bootlegger class, they called it. Their ambition was to win the Gold Cup. These guys had come up through school together, and they wanted a boat. Engines were surplus then, Allison engines, and so they got hold of John Hacker and he designed it and they let Les Staudacher built it." Cantrell tested My Sweetie on the Detroit River. It was one of those moments that come unexpectedly, and stay with you as long as you live. "Great feeling! Gawd! I'd never had anything like that before. I was surprised and quite frightened the first time I set in it with all that big powerplant in it. I'd never seen anything like that or that big! But it felt good. Just felt good to have all that power underneath you. Just like when I got out of the flathead and started driving overhead on race tracks. Geez, you have all that power underneath, and you just stomp on it. Boy, I tell ya, it makes you alert real quick. You come alive because that thing will skin you up real quick. You got to stay with it." Schoenherr and Gregory liked what they saw, too, and Cantrell was asked to drive the Sweetie — "for nothin, just expenses, ya know." Cantrell remembers coming to Detroit as a star, but he was uncomfortable with it. "Well, that was quite a step for me. When I came to Detroit I was in the position then just like Muncey is now. I had to try out everybody's boat, take a ride in it and, man, there were some miserable ones there — they came out from the woodpiles and everywhere. You couldn't believe the designs and stuff — everybody wanted to get into the act. And I had to take a ride in all of them — try em out and pass opinion on them, what they needed an all." But the limelight did not carry Cantrell very fast for very long. "The first year — 1948 — I could've won any steeplechase in the country — it's make three big leaps, and I'd have to get out of it. Old man Hacker had put a hook in the backend of it, so the driver was settin' right over the water." Nineteen forty-nine was an altogether different year. During the racing off-season, Staudacher cut 21 inches off the back end of The Sweetie, and the copper fairwater underneath the shaft was cast. The boat's bottom was straightened and Hacker's hook was removed. "That year we won 32 heats out of 33 starts — it's never been equalled up, but I don't bark about it." The obvious highlight of Cantrell's summer of '49 was winning the Gold Cup. But it was not an easy afternoon. In the first heat, Cantrell placed third, losing to both Skip-A-Long and Such Crust I. Cantrell's troubles began on the second lap when the foot throttle broke and Cantrell had to manipulate it with his hand. "When I went into the turn near the bridge on the second lap, the throttle stuck and I couldn't decelerate. I was afraid the boat was going to turn over. I guess a couple of gallons of water came into the cockpit. I kicked at the throttle and bent it badly but I got it loose, down to about 2,000 revs. Then I couldn't accelerate on the straightaway. I kept one hand on the wheel and pulled the throttle line with my right hand and let the engine drop to 2,000 revs on the turns. I was glad to finish third." But in the second heat, Cantrell roared ahead of Miss Pepsi, Tempo [VI], Such Crust I and Skip-A-Long to win. Going into the third and final heat, Cantrell and Sweetie were tied in points with Such Crust I, each with 625. Skip-A-Long was just behind with 600. Tempo trailed with 338, Miss Pepsi with 127 and Miss Great Lakes with 95. In addition to points awarded for the order of finish, the Gold Cup rules of this period also provided that an additional 400 bonus points be awarded to those boats registering the fastest heat as well as the fastest 90 mile race. Cantrell knew that his first heat average of 65 mph, nearly ten miles slower than the winner Such Crust I, would make it impossible for him to record the fastest 90 mile race. Cantrell needed a flawless performance in the third heat — he had to finish first, and he had to run as fast, if not faster, as he ran in the second heat to acquire the 800 points needed to win the Gold Cup. These complexities weighed heavily on Cantrell as he prepared to leave the dock for the final heat. "We were pitting in at Gregory's up there. And he had light plants and battery chargers all over the place — exotic things. They had a little light plant on Sweetie's batteries, charging them up. Well, we got towed out into the River to fire up and go. Well, when they cut me loose, and I fired it, I had no boost pump. It wouldn't fire. So I hollered for Ed. I said, 'Get over here, give me a prime — I've got no boost pump or anything and the prime is not working.' He said, 'Well, what are we gonna do?' 'Well get some gas out of that light plant and pour it in something.' And they couldn't find anything to pour it into. So they had a stem light on the back of the Sweetie and a flagstaff on the back. I said, 'Unscrew that cap on the stem light and fill it with gas two or three times and pour it in the carburetor. I said, 'It's now or never!' And I pulled the dump back and had everything all set an all. And she fired off. Of course the engine pump picked up the fuel and went on with it. But, Gawd. The one minute gun had gone off!" Cantrell won the heat at 78.645 mph. He collected the points he needed. And he won the Gold Cup. The big fame had not come until his forty-first year. Cantrell took the checkered flag and an extra lap or two to cool the engine. Then he brought My Sweetie slowly to the judges' dock. He climbed out of the cockpit, looking at his watch. He counted off the seconds he had needed for the fastest heat. The calculation completed, he walked to the bow, kneeled and kissed Sweetie's deck. "You kissed My Sweetie on the bow?" I asked. "Yeah, yeah," he admitted awkwardly. And he began to explain the meaning of his private celebration, as if it had suggested a kind of romanticism unbecoming to a tough speedboat racer. "Well, ya know, I'd seen the Gold Cup many, many times on the Pathes in Louisville. They'd show Gar Wood and them runnin’, and all the boats. Aerial views of it. And I had hoped some day to just be there — just like kids coming up today runnin’ race cars hope to get to Indianapolis. And that was my ultimate . . . being able to run in the Gold Cup sometime. And it happened to me. And I realized it then. I thought, 'well here I am in the spot that I always wanted to be.' And it had happened. But it happened in a way that the thrill wasn't there coming up to it. Not until it was over. Then the impact hit me — what I had accomplished, what I had done. I was reminiscing back and thinking back as a kid coming up . . . those movies of Gar Wood with them four big engines. All that horsepower. My Gawd. It was unbelievable." Cantrell remained with the very expensive sport of boat racing, and he worked for some of its most moneyed owners. But despite his association with powerboating's high society, he remained of it and not really in it. Cantrell was a country boy, equipped with an old-fashioned sense of dignity and an uncomplicated motivation to reach simple rewards. He seems to most fondly remember the earlier and more amateur years and their unpretentious spontaneity. And within that, he defines his conception of fun. "I enjoyed it a lot when I was racing. It was the competition then. Now it's big business — a serious, serious business. When we were running yesterday, we were just like a family: get everyone out and go out there to run to beat hell and beat them out on the course. But loan them anything you had. Today . . . well, the selfishness of it and all . . . maybe I can blame them, maybe I can't. "I never did care for the glamor part of it. To me driving a speedboat was job that I did and did well. It was just like a chauffeur or a preacher or a boxer or whatever. And all that fanfare — I guess it was allright, but I couldn't see it." Cantrell stopped driving in 1968 when he was 60. For the remainder of his professional association with powerboating, he supervised the Schoenith's racing operations. And he accepted his changing role with characteristic grace. "Well, just as long as I was connected with it and doing the things I wanted to do — creating things. I mean, you'd have a thousand ideas and maybe one would perform for you. And it's a great feeling — a great reward feeling — to be abet to accomplish something. And I enjoyed it very much. I looked forward to it -and to watch guys go out there and take my place because whatever we're doing, we know someday we're going to have to step down. You can't do it all your life. And that's including living, you know, ya got to step down. And you just don't postpone it. Bill Muncey said to me one time, 'you know, I tell ya, at times I get to thinking about myself.' And I told Bill, 'You'l1 know it the day you get in the boat and you don't respond to it,' And I said, 'You'll know it, just stick with it for what you have done and then get out of it and put another guy in because you'l1 enjoy managing, runnin’ and schoolin’ somebody else."